It's been a few months. Sorry about that. I basically just got through Diversiverse and then disappeared. I don't know why 2015 has been such a difficult reading year for me, but it has been an upward battle. The whole year, I have struggled to finish books. I have marked more books as DNF this year than ever before. Often, I don't even bother marking books as DNF. I start a book and enjoy it for 50 pages or so, and then then never get back to it. Other books, I just don't even start. I now have a long walk to work instead of a long car ride, and for some reason, this has severely impacted my ability to concentrate on audiobooks. All of which goes to say - it's not that I dropped blogging after Diversiverse, it's that I haven't finished a book for a really long time. Or at least, not a book that I feel the need to talk about. I finished reading Terry Pratchett's last book, The Shepherd's Crown. This was difficult for all of the reasons (or lack of reasons) I stated above, with the addition of being a particularly poignant and emotional read for me as a huge Terry Pratchett fan. Actually, I started reading The Shepherd's Crown quite some time ago, but the first chapter had me weeping so much, I had to step away from the book. I mean, it's an AMAZING chapter, but goodness. It was rough. I'm not going to lie, it's basically impossible for me to objectively review The Shepherd's Crown. I absolutely adore Tiffany Aching, I love her loyalty and her Beyonce-level Sasha Fierce-ness, I adore the Nac Mac Feegles, and pretty much everything about this series. I may be putting things into my reading of this book that Pratchett never meant to be there, but the whole story felt so much like goodbye to me that it was almost too much. Tiffany's absolute passion for her home and her people felt to me like Pratchett was writing a love letter to England and all he feels for his country. The absolutely beautiful section where DEATH makes his appearance after so long was like a goodbye to all Discworld fans. And the battle scene at the end and all that happens there - it was almost like Terry Pratchett for a minute took off his mask and showed us just how terrible he thinks the world is. And then he reminded us that, even if the world really is terrible, some people work so hard to make it better. I don't know if I can think of any author who has had as much of an impact on me as Terry Pratchett has. I said as much in my post about his death. I have seriously considered giving up blogging and putting up the "CLOSED" sign on this little piece of the internet. It's a lot of work, and I don't know that I have much to say that is particularly new or relevant. 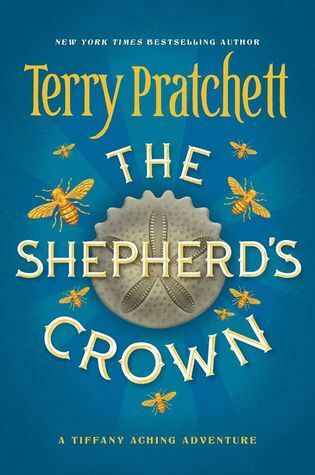 But then I read something like Terry Pratchett's last book, and it's not as though The Shepherd's Crown was the greatest book ever written, or even the greatest book Terry Pratchett has ever written, or even the best book in the Tiffany Aching series. But, reading it, I wanted so much to talk to all of you about it, and ALL THE FEELS it gave me. I am not being very coherent. I am out of practice. But. Well. I miss you. I miss talking to you, and I miss discussing books, and I miss chatting on Twitter, and I miss emailing back and forth about plot developments and events and quotes that we don't share on our blogs because they cold be spoiler-y, but that we want to share with each other because we read the same book and we were affected by that book, and we want to share that experience with each other. That's what blogging is for me! No matter how sporadically I may do it. Yes, this, so much. I've missed you too, and I value the things we've shared over the years so much. And this book actually got me thinking about that too - human connection and community and how for me that's a part of fighting for a better world. This comment is completely incoherent, but I'm going to hit "publish" anyway and trust that you know what I mean. I don't know how anyone could not read more into this book than was on the pages. It's just going to happen and we're all going to feel a million times sadder and a million times more nostalgic than the actual story warrants (except for the first chapter, of course ... argh! sob again!) I am fairly certain that I don't have anyone in my daily life that I can discuss this book and all its feels with so it makes me appreciate my blogging friends even more. All of this to say, you have definitely been missed and please don't go! I haven't read the book yet because I get kind of upset just thinking about it. I've missed you around, too, but boy do I know those reading ruts that you're talking about, where nothing is right and everything is completely put-downable. But I'm a firm believer that there's no point in doing a blog like this if it's not for the pleasure of it. Which means you pop in when you want to, and toss out casual comments when you want to, and talk about your rut if that's what you want to do. I'll be here reading whenever you turn up! I get exactly what you mean about the book. It had me in tears at multiple points. Aw, I've missed seeing you around and am glad you're back. It wouldn't feel right not to have you around for The Raven King later this year :) I think, for me, blogging isn't really about saying anything new or making a big splash but about making room for conversation, and that's why I keep at it. But sometimes life gets in the way--I've had tremendous distractions these last two months, and that's kept my blog pretty quiet and my reading slow and noncommittal, but it's reassuring to know that the blog and the community will still be there when I have the brain space for it. Someday I'll get around to finishing the Tiffany Aching series. I enjoyed the first two books but haven't managed to find time for the rest. Maybe 'tis the season for returning to blogging, sporadic though that return may turn out to be? Because I'm right there with you. I'm glad you'll still be around. It's good to see a post from you! Sporadic posting or no, I always enjoy reading what you have to say. I love this post so much, and I love this series so much, and I love reading your thoughts so much. Speaking of The Feels. I love what you wrote here and I feel this not only in books but from watching the world this year: "even if the world really is terrible, some people work so hard to make it better." I had a bad year for blogging about books, but I'm hoping to make a comeback, too. So relieved to know you're not giving up blogging! Missed you after Diversiverse ended! I need to start writing blog posts while I'm still reading a book, I think, because as soon as I finish one book, I start on the next, and no longer feel like writing about the last one!